As a fan of the Fast and the Furious I was devastated when I heard about Paul Walker’s death. Growing up it’s hard to deny that the F&F series didn’t help influence my love for cars. As a small gesture of thanks I wanted to create a small tribute for Walker. I’m releasing a new wallpaper featuring 12 iconic cars that his character drove in the F&F series. 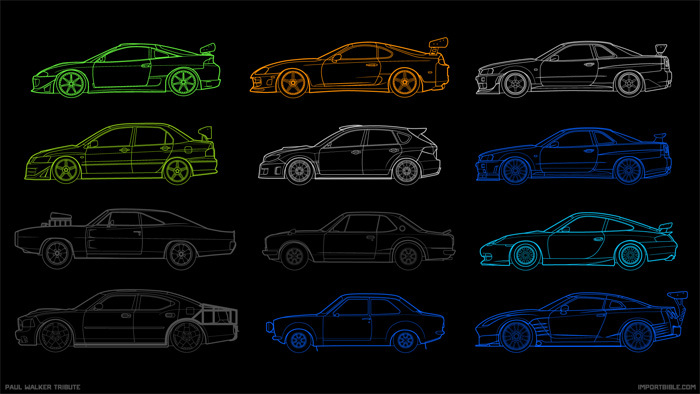 Available for pre order are “The Buster” shirts and posters featuring the 12 cars from the F&F series. All profits from the group buy will be donated to Paul Walker’s charity Reach Out WorldWide. The Buster shirts will feature a small “Remember The Buster” chest print on the front and a gigantic 6 color print on the back. Shirts are silk screened using high quality American Apparel tees. The Buster poster will be our first print ever! No full color prints here, the posters will feature crisp silk screened prints on 130lb cover letter paper. Unfortunately due to costs the design will feature only 1 color. Dimensions of the poster will be 11″ x 17″. Posted by David Nguyen, 5 years ago.